Caring and providing for an animal brings a whole new set of responsibilities, such as thinking ahead with regard to danger areas in your home (e.g. poisons, uncovered swimming pools, unsecured gates, etc.) as well as ensuring that the new member of your family is groomed regularly, fed, sheltered, watered, identified, vaccinated and de-wormed. Cats or kittens will usually find their own preferred area to sleep. Providing them with a soft blanket or towel should be sufficient. Be careful when starting up the washing machine or tumble drier. If the door has been left open, ensure that your kitten is not sleeping inside before switching on. NB: It is important to remember that young animals, like human babies sleep a large percentage of the day and children should be prevented from carrying them around all the time as this can cause them to stress and may also make them irritable. 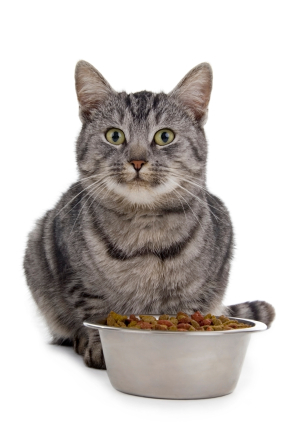 Provide your cat with his own food bowl. Cat eats from a bowl. Isolated on white background.Feed a diet which has the correct balance of minerals, vitamins and protein – it can be more cost-effective to feed a cat with a premium well-balanced product from your vet than with cheaper products. 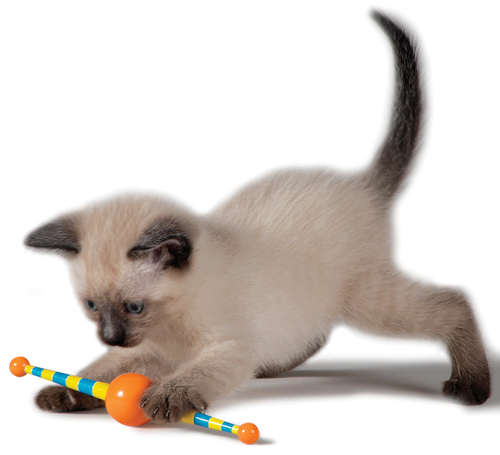 Cats and kittens enjoy games so play with your cat (but do not tease it) whenever you can. Ensure that toys are animal friendly and cannot be ripped apart too easily. Most cats really love catnip from time to time which seems to put them on a bit of a “high” – it can be grown in your garden or in a planter inside the house or flat. When giving treats, ensure that they are specifically formulated for cats. That they are real live creatures that feel emotions such as affection and fear. That they are not toys and that they can be hurt easily. 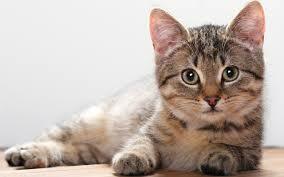 Cats should be de-wormed and vaccinated on a regular basis and have health checks annually. Kittens cannot be fully vaccinated before 12 weeks, and should not go out of your property until this has been undertaken. It is your responsibility to ensure that the second and third vaccinations are given to your new kitten. Without these vaccinations, your kitten is very susceptible to diseases such as Snuffles. It is highly recommended that your pets be identified. o With a proper elasticized cat collar and ID tag. o If you can afford it, with a microchip as well. INTRODUCING YOUR CAT TO ITS NEW HOME. When you get your new companion home, check that all windows and doors are securely closed. Have a room set aside where the cat will be kept initially – ensure there is a litter tray (use cat litter rather than sand from the garden), a bowl of fresh water and food. 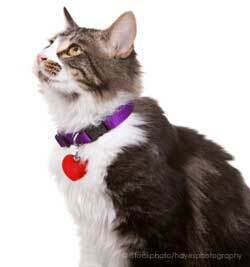 Close the room door and let the cat out of the carrier – reassure the cat quietly while it investigates the room. If there are no other animals to be introduced to in the household, allow the cat to investigate the rest of the house. It is recommended to keep newly adopted cats indoors for the first 5 to 7 days to prevent the animal from wandering off and getting lost. (If the cat is of a nervous nature, extend this period indoors). This time, spent inside your home, is to allow the cat to develop a homing instinct to where it now resides. Cats don’t always take kindly to having a new feline invade their territory. Let them first get to know one another by scent, before you allow a face-to-face meeting. Keep the new cat in a separate room with the door closed for at least a day or two. Scent is very important to a cat and the best way to start to build a bond between them is through smell. Swap beds between the cats daily and rub them all over the face and flanks with the same cloth several times each day. After 2 or 3 days of separation, place the new cat in a cat carrier, then open the door to the room and let the resident cat come over in its own time to meet the new addition. Just let them sniff and investigate through the bars for 5 minutes or so – do this a few times a day until you are satisfied that they have started to accept one another. When they seem fairly comfortable and curious, allow the cats to interact for short periods of time outside the carrier. Don’t shut the cats up in one room when they meet: instead, give both cats the opportunity to retreat to a different area of the home if need be in order to avoid a fight. A little bit of hissing is normal during the first few weeks as the cats work out their place in the feline hierarchy of your house. 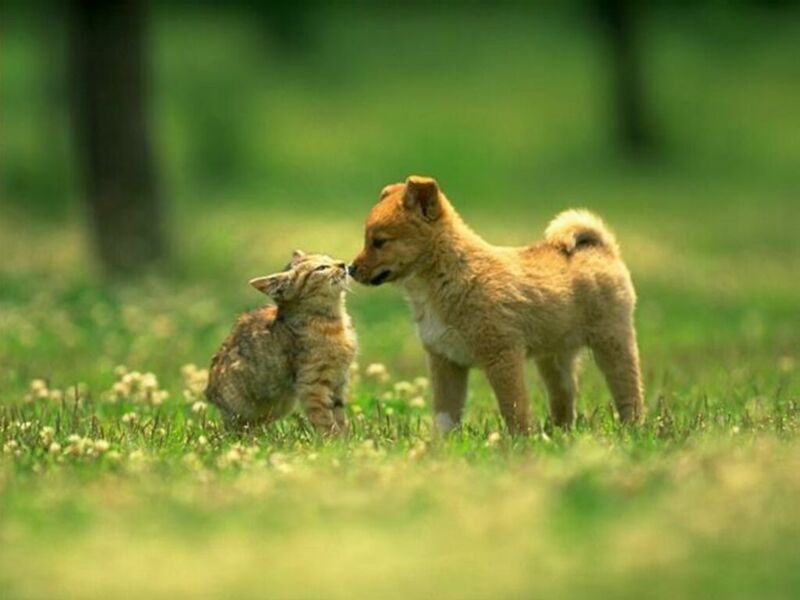 Dogs and cats who have not experienced each other will require some extra time to become accustomed to each other. Dogs usually want to chase cats, and cats are usually afraid and defensive. Ensure that your cat has its bedding/nest, food and water, out of reach of the dog. After the animals have been exposed to each other’s scents, you can try a face-to-face introduction in a controlled manner. Put your dog’s leash on and command him to either ‘Sit’ or ‘Down’ or ‘Stay’. Have another family member enter the room and quietly sit down with the cat on his or her lap. If the cat is nervous – use a carrier. Reassure them by talking quietly and calmly and if it helps to relax them give them ‘titbits’ simultaneously. At first, the cat and dog should be on OPPOSITE sides of the room. Repeat this step several times until both the cat and dog are tolerating each other without fear, aggression or other uncontrollable behavior. Next, move the animals a little closer, with the dog still on a leash and the cat gently held in a lap. THIS MUST BE DONE WITHOUT FRIGHTENING THE CAT. During the introduction process you may want to keep your dog on a leash, and with you, when the cat is free in the house. Be sure that your cat has an escape route and a place to hide out of reach of the dog. When you are not at home, and until you are certain that they will both be safe keep the dog and cat separated.